Here we are a few months into being a mommy and I feel like I'm starting to get the hang of a routine. I may not have all the answers or really the chaos under control but living our day to day life, I've found some items I can't live without and products that will definitely be used for future babies and recommended to all my fellow pregnant mamas! Let's recap, shall we? THE HONEST COMPANY // All the hype about The Honest Company is legit. I was hesitant to even give the diapers a try because knowing how much I love style, I thought I'd be wasting my money on diapers that essentially are worn for 2 hours tops at a time. Well, I did some research, budgeted a bit and found that when I bundle my diapers and wipes with Honest, I'm saving money! Coming from someone who was buying those at Costco, I think that's an amazing deal and better yet, I get to pick all the cute patterns for the babe! COMOTOMO BOTTLES // I had the hardest time trying to find a bottle I was happy with! Who knew it would be so hard to come by one that didn't leak, collapse or cause air pockets...? My goodness! I finally chose to splurge a little and ordered a set of 2 of these to try and soon fell in love. They're silicone so they are so easy to clean and closer to a natural breast so Emery really transitioned well with these. We have both green and pink lids! LOU LOU & COMPANY BLANKETS // When we brought Emery home, she hated being swaddled so over time I forced it and now she can't be without it. I've debated getting her used to not being swaddled but after finding these knit blankets, I've decided to let her stay swaddled and secure as long as it's not posing a threat to her because it's what she loves. These blankets are literally the bees knees. So soft, so flexible and perfection for wrapping my little baby into a burrito. I love them for throwing over her car seat while out too to protect from the sun or even laying them down for her to play on. Confession: I have 6 now. Oye! SLEEP SHEEP // I sort of thought white noise was shenanigans until we were going about our business throughout the house and every damn noise woke E from her slumber. Since then, I snagged this baby and throw it on when I lay her down for 45 minutes and it's been a dream. Even when the house is quiet, I think the variation of noise it offers gives her some peace and calming while lulling her to sleep so I would definitely recommend it! NUK PACIFIERS // We were huge fans of the Wubbanub paci when Emery was little younger (and still are) but she tends to keep the NUK pacis in her mouth better during the night. Most of the time, I try to lay her down without her paci but if she isn't quite out yet, she likes it and this stays put. It's also great for being in the car and such as well because I know it stays in place with it forming to her face better and the colors offered are so fun! By no means am I a pro or really even know what the heck I'm doing but over the last couple months, I've been reaching for these goodies time and time again. Ranging in cost from minor to splurging, I know they might differ for each persons budget but I can't recommend them all enough. 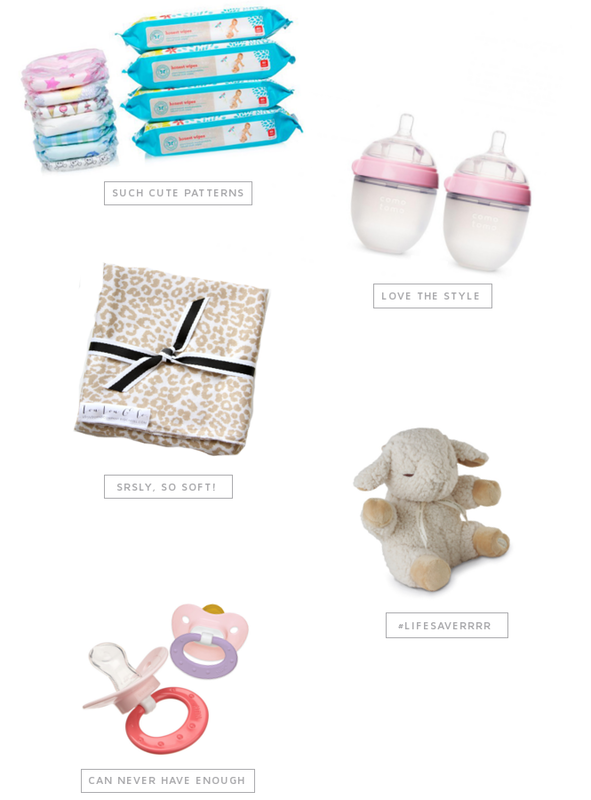 I hope this helps all you new mommies or old ones that are searching for some goodies for your Littles! We love Honest diapers and Nuk pacifiers too! I may need to try the sleep sheep. Thanks for the recommendations!